There is no doubt that the Lord uses short-term missions to make an eternal impact on the lives of many who intersect with our teams around the world. However, just as powerful is the way God changes the lives of those who choose to go. I like to say that their “mustard seed” of faith grows into a “sesame seed” and their lives are never the same. Just a couple weeks ago, I heard from a student that was so impacted by his experiences in Ecuador, that he sensed the Lord asking him to give up football so he could spend more time growing in His faith and sharing his faith with his peers. Instead of going to college after he graduates in June, he has decided to be a part of a “gap year” (year between high school and college) mission program, sharing the gospel around the world. This spring and summer, we are sending twelve teams to ten countries on four continents! Our spring locations include the Czech Republic, Ecuador, Hungary, Portugal (Lisbon and Porto), Puerto Rico, Slovenia and Spain. 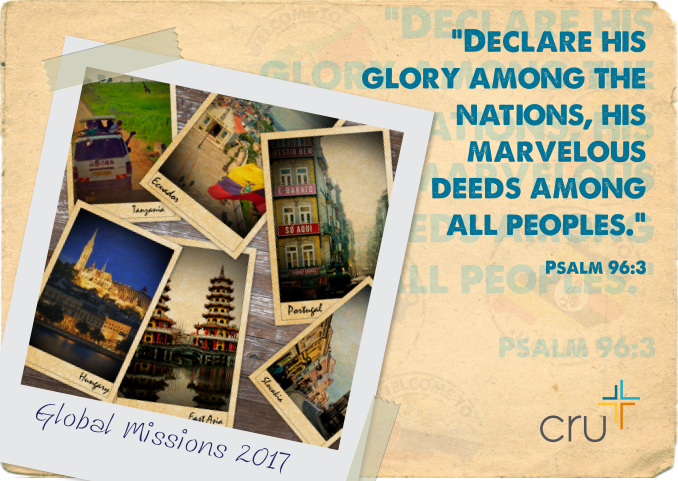 Interested in a summer mission? Apply at cruhighschool.com/go-global to go to East Asia, Hungary, Japan or Tanzania. Please pray that God would do a powerful work in, and through, those who go. It’s often hard to let you know how much we appreciate your partnership in our ministry. So when an opportunity comes along, we want to jump on it. One of the most valuable resources within Cru is the Weekend to Remember (WTR), hosted by FamilyLife, our ministry to couples and families. For 40 years WTR has built into and strengthened marriages. Thousands of couples, some thriving and some struggling, have experienced new levels of spiritual, emotional, and physical intimacy. Just to fill you in, your getaway will feature two and a half days of practical teaching and insights from the nation’s top marriage experts, along with plenty of time to relax and enjoy stress-free time alone. To take advantage of this opportunity, simply visit FamilyLife.com/Locations to select a date and location that works for you. Then enter promo code: CruThanks at checkout to receive your discount. The registration covers the conference only and does not include the cost of the hotel stay and meals, should you choose to stay the night. If you decide to attend, let us know. We’d love to pray for you during that weekend!